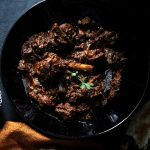 A rich yet delicately spiced mutton curry with meat that falls off the bone is a special treat for special occasions. Cut the mutton into medium sized pieces, wash, drain & keep aside. Heat oil for shallow or deep frying in a kadai/wok and fry the onions till golden brown (do not brown them too much or they will turn bitter). Remove and place on an absorbent kitchen tissue. They need to be very crisp. Heat 1-2 tablespoons of oil and fry the meat in batches till it turns golden brown. It is important to fry in batches and not overcrowd the pan as the meat will start to release its juices and cook under steam instead of getting fried. Once done, keep the fried meat aside. Heat the ghee in a pressure cooker. Add the cinnamon, cloves and black cardamom and let them sizzle. Reduce the heat completely and add the yogurt mixture. Fry it till the oil begins to separate. Add the ginger & garlic paste and fry again for 2 minutes or till the raw smell vanishes. Add the onion and cashew nut paste and fry again for 2 minutes. Now add the fried meat and mix everything well. Add a cup of water, salt to taste and pressure cook till the first whistle goes off. Then reduce the heat completely and continue to cook for 10-12 minutes. Turn off the heat and let the cooker cool down for 8-10 minutes or till the weight (whistle) comes off easily. Open the lid and continue to cook on a low heat till the consistency of the gravy thickens. It is okay if the mutton is slightly overcooked as it is meant to fall off the bone.